I'm busy researching to install a pair of French doors in my home workshop where we host our DIY Divas workshops and decided to share details on how to make and install your own French doors. I have a large window in the area where we host our DIY Divas workshops and I'm looking to replace this with a pair of French doors similar in design to the ones shown above. Before I take on this project, I'm doing some research as to how easy it would be to make my own French doors to fit the space, since it's an awkward space and standard doors won't fit. I also want to look at the process for making my own French doors, using locally available timber such as Meranti or Saligna, and how much this would ultimately cost. A pair of ready-made Meranti French doors will cost around R3000 for cottage pane or almost R5000 if you want a solid panel at the bottom, and I reckon you could make these with Meranti at a cost of about R1500, so there's already a big saving in that area. 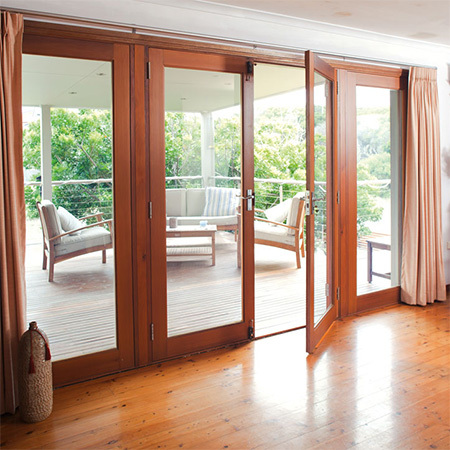 It's the fitting of the doors that puts the cost quite high and this can vary from around R2000 upwards. If you're interested in making and installating your own French doors, take a look at the videos below and you will see that it's not as difficult as you may think. The first video looks at making your own French doors, and the bottom video shows how to replace a window with French doors.